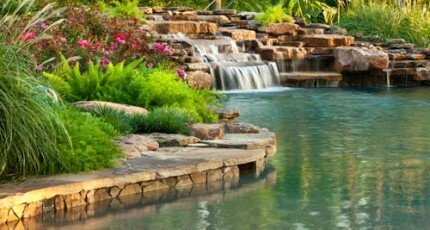 Stone landscaping takes many forms in Houston landscape design. It can be used to create highly formal elements that support the strictest of Old World themes. 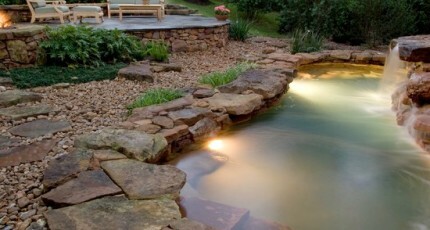 It can also be used to create a wilder and untamed look by supporting such elements as tree growth and natural ponds. One of the most powerful benefits that it offers to the Houston homeowner is a durable functionality that is every bit as practical in application as it is attractive in aesthetics. Its ability to support any style of architecture and landscape theme makes it a basically universal tool of professional landscape design, and one that is sure to add curb appeal to any Houston residence. 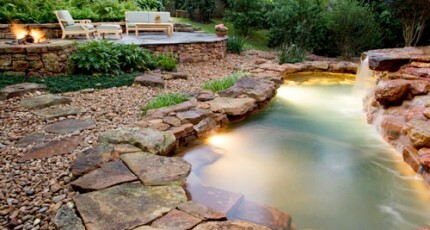 Natural stone landscaping is used to soften the landscape with a deliberately organic look. It is employed extensively in pathway and patio construction on lots of various dimensions. Houston landscapes with large trees benefit from stone decorations because it creates a natural feeling one would expect in a park, a forest, or mountain area. Different types of stones are necessary to maintain a balance between decoration and practicality. Walkways and patios of any kind must have a smooth surface for safe transit and comfortable seating. Using cut stones and special construction methods, we can create a surface for you that is as smooth as a concrete sidewalk, yet looks like something that sprung from nature itself. 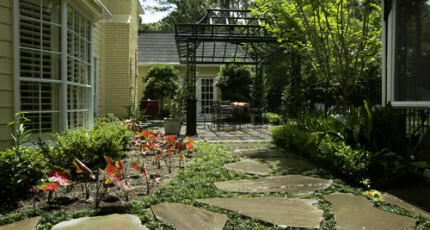 Flagstone is often used in very upscale stone landscaping designs. 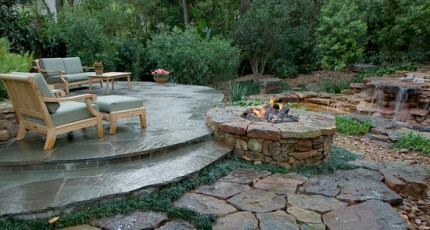 Flagstone patios are opulent in nature and contribute a sense of splendor and luxury to any property they inhabit. 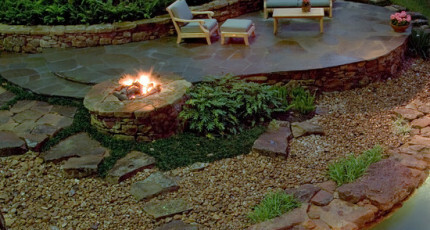 Flagstone is a popular material to use in the construction of entry gardens. Both the entrances to the garden and the patio within it can be made of this material to create an outdoor living environment that rivals the living room of a custom home. Flagstone itself can actually be used as an interior flooring material. While Exterior Worlds does not provide flooring services for home interiors, we can create equivalent floor plans in outdoor buildings and outdoor living rooms. For homeowners looking to create an outdoor kitchen that can rival the interior of the house, Themes built with flagstone in and around the summer kitchen will certainly fulfill this requirement. As its name suggests, decorative stone landscaping is more about aesthetics than function. Forms created using this technique are normally placed near areas of activity to add an aesthetic element to something practical in nature. For example, in many Houston landscape projects we encounter areas of an asymmetrical property that are too small to be landscaped with traditional methods but too large to leave fallow. Decorative stone landscaping and custom garden design are two ways we can turn these areas (i.e. the space between the side of the home and the garage) into truly beautiful spaces. Whole or crushed stones can be used to shape the asymmetrical space into patterns that compliment the exterior or the home. This is then supplemented with plant life that adds a new vitality to the scene. Contemporary garden design often uses stone landscaping with highly polished rocks to achieve its inherently mathematical and mentalist look. Cut granite, marble and quartzite can be positioned in a contemporary garden with the proper design so that only a minimum of organic matter is needed to make the garden complete. Stone landscaping walls play many roles in a Houston landscape project. Perhaps the most useful application of natural stone walls is the construction of retaining walls. Retaining walls hold back earth so the grade of the land is more controlled and suitable for irrigation and drainage systems. Such walls can always be built as ornamental structures as well. It is common to plant gardens in the earth they retain, and some are even built in tiers to create a multi-level structure of earth that adds vertical impact to the property. Another way to create a highly customized stone landscaping theme is to use pavers to create hardscape elements. Stone pavers are pre-cast blocks that provide a very high-end alternative to concrete and brick. They interlock with one another and provide an amazingly durable surface that is aesthetically pleasing. A paver driveway, for example, provides an impeccable first impression of a home and the lifestyle it symbolizes. In terms of durability, it can be counted on for decades not to crack or lose its luster. 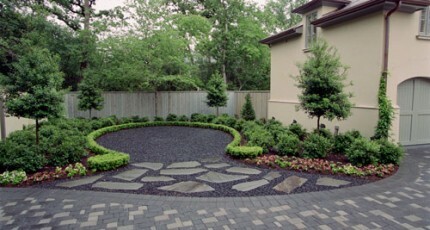 Garden pathways made of pavers are often used to accent formal garden design. Many clients that hire us to create formal gardens have homes with an obviously Old World façade. This formality is defined with transit areas of superior materials and more deliberately planned hardscape patterns. Homes will greatly benefit from an entire hardscape theme where paver stone landscaping is the predominant material used. Private patio areas, for example, can be built in the very back of the yard and made accessible with special walkways that provide family members with their own personal retreat. Learn about Natural Stone Landscaping.